I was in France last week. In Normandy to be precise. I'll probably write later about the CItie de la Mer in Cherbourg or Omaha Beach or Etretat but today I want to quickly mention Lillebonne. Lillebonne is a small town near the mouth of the Seine, about 30km from Le Havre. 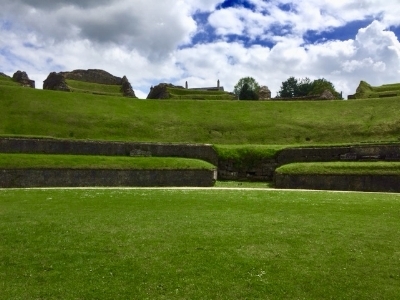 It has a pretty well preserved Roman theatre (one might also say amphitheatre). After Caesar subjugated the Gauls in the 50's BC, Juliobona - as Lillebonne then was - grew in importance in Roman northern Gaul. As well as the usual forum and bath house, Juliobona sported a theatre that held an audience of around 5000. This was built by the Romans in the first century BC. It was used for the next three centuries until the various waves of barbarian invaders gradually caused its ruin in the fifth century AD. The population by then were more concerned with fortifying the town against the marauding Goths, Huns and Franks than watching classic Greek plays or contempory satires (and yes, probably some cruelty). So the town and the amusements declined and were left for ruins for 1500 years. And yet, here it is still! Rediscovered in the 19th century, partially standing, the theatre rises anew reminding us yet of the power of western civilisation. But also cautions us about it's decline. When I went last week it was beautiful day, hot, humid, a late spring day full of flowers and dappled sky. The grounds are immaculately kept, you can wander around at will and gaze at the Roman' architectural skill so many years later. Turner's painting of the Norman Castle LIllebonne 1832 shows the hollow beneath where the Roman Theatre would later be excravated. The castle still stands - a snag toothed ruin hidden from view but the star of the show now is its older cousin - the Roman Theatre.